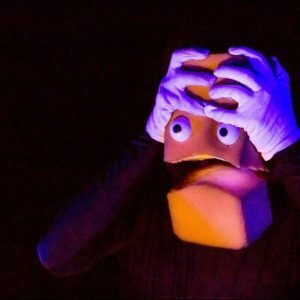 A lo-fi puppetry spectacular that bends time and melts your heart. Bruce effortlessly sold out two seasons at the Edinburgh Fringe Festival and is yet another award-winning international smash hit from the makers of The Adventures of Alvin Sputnik: Deep Sea Explorer. Keeping you at the edge of your seat, Bruce will sweep you away on an epic adventure of love and revenge. He may be just a yellow block of foam, but Bruce is out to prove he’s got a heart of pure gold. Brought to life by jaw-droppingly talented puppeteers, Bruce takes the audience on an action packed, hilarious adventure, narrating his story as a self-proclaimed hero-cop turned novelist-astronaut. Bruce is a loveable screw-up; he’s got one last shot at redemption but, with a lifetime of regrets hunting him down, he’s running out of spacetime. Fusing mime and puppetry, Bruce is a non-stop rollercoaster of action, adventure and nostalgia.